Estate – Eagles Nest Winery and Cottage grew from a desire to escape the constraints and aggravation of urban life and pursue a rural lifestyle that including farming. We sought a parcel of agriculturally zoned land including land use permissions for a second dwelling for elderly parents. A scenic view was a desirable option. 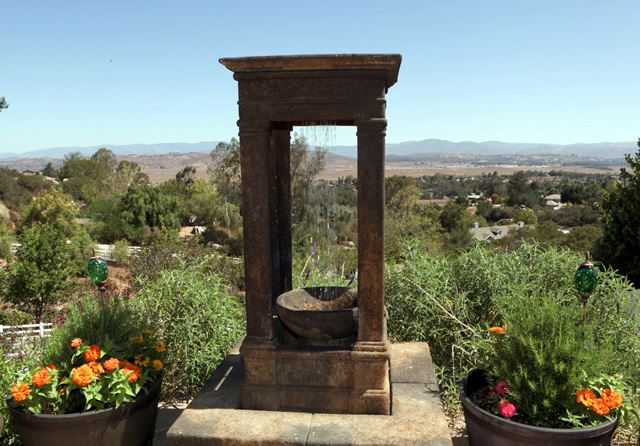 After a nearly one year search, Julie while recovering from carpel tunnel surgery as a result of excessive keyboarding from both teaching and developing her college’s award winning website, found a unique parcel with a commanding view of the west Ramona Valley. This valley was later to be designated an American Vinticultural Area (AVA) by the Federal government in recognition of its excellent winegrape growing climate and terrior (soils and geography). The San Diego region has historically had wine grape production dating from the later 1700’s and California’s Spanish Missions. As an enticement for the husband to trade a 10 minute urban commute for forty minute rural commute, Julie arranged for the construction of an architecturally appealing barn to house equipment to maintain several acres of hillside property, and family vehicles. Later construction of a second dwelling (Eagles Nest Cottage) and two buildings for the winery operations followed. The original owners of the property built at two-story craftsman home at the top of the hill when a neighbor in the heavy equipment business found a way to bulldoze a driveway to the top of the granite boulder strewn parcel, leaving the mid-hill parcel for nursery and orchard operations. Eagles Nest was subsequently built mid-hill on the originally intended residence pad, but with a covered deck built upon the immediate hillside to fully showcase the breathtaking view of the valley. The view desk and luxurious appointments of the cottage are its signature features. The balance of the estate was prepared and planted with several thousand European varietal (vitis vinifera) winegrape vineyards, in both trellised and head-pruned configurations depending upon the topography. The hillside layout of the vineyards facilitate excellent growing conditions with cooling convective flows and air currents that discourage the growth of white powdery mildew. Much of the parcel was previously farmed in apple orchards so the soil has benefited from years of organic soil deposits and light intensity farming.